Hey Larry, how ya doing? 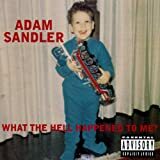 All Adam Sandler - Moyda lyrics are property and © copyright of their respective owners. All Moyda lyrics provided for educational purposes only.